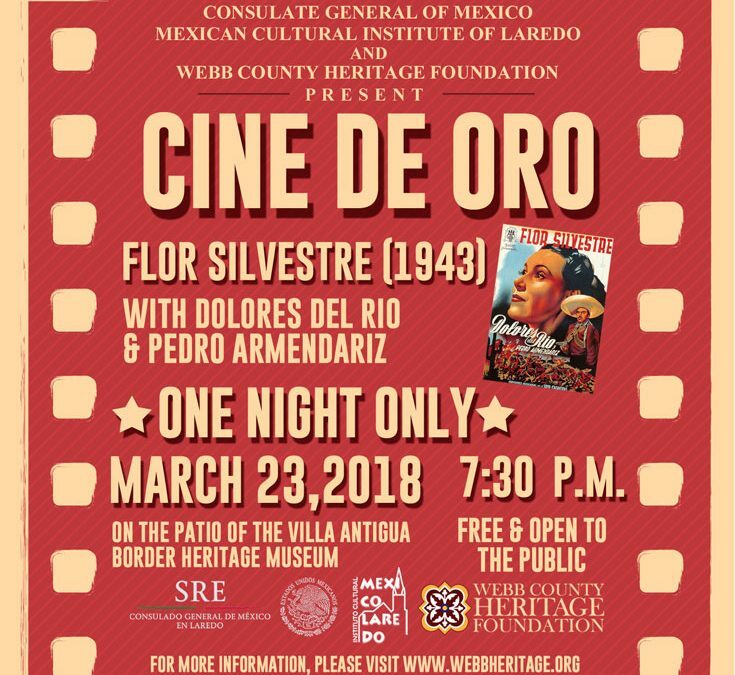 The Webb County Heritage Foundation, in partnership with the Consulate General of Mexico and the Mexican Cultural Institute of Laredo, will present “Flor Silvestre”, a classic film of the Mexican Golden Age of Cinema, on Friday, March 23 at 7:30 p.m. in the patio of the Villa Antigua Border Heritage Museum, 810 Zaragoza St. The 1943 film, often referred to as the “greatest love story of all time,” stars Dolores de Rio, Pedro Armendariz, Emilio Fernandez and many more. It is considered the film that defined the golden age of Mexican cinema. The event will take place outdoors, with seating provided. Admission is free and snacks will be available for sale. In case of bad weather, the event will be cancelled. Come enjoy a classic film under the stars at the Border Heritage Museum in historic, downtown Laredo.